I had fun titling my mini fruit series! Well, after all it isn't a Vauxhall Cavalier, is it?? Does it have a steering wheel? No! And why the bonkers titles? Well, I'll be sharing my views on titles in the first of my Quarterly Newsletters, which comes out on the 1st of May. So don't forget to sign up if you haven't already! Over the year I'll also be sharing news, studio tips and offering subscribers exclusive discounts. I'll also be linking up to some of my favourite Artists! I truly enjoy creative title and those that make the viewer stop and think for a moment. And I love the series - Traffic Lights! These fruits are gloriously delicate. Your soft edges are are amazing! You are hilarious, love the traffic lights. I always have trouble with titles so I'm looking forward to your newsletter. Will it be called "not a No. 9 Bus" or is the crazy reserved for painting titles??? It's funny, I love choosing a title for my paintings! I find it fun! Hi Sandra, find a title for my painting is always difficult, it will be interesting reading your views on title. Anyway "Traffic Lights" (green, yellow and red) is a "super" title for your last beautiful works. Ciao! Sandra, Wow! They look so classic. Beautiful detail. What a lovely series! Sandra, these are SUPERB!!! They absolutely glow from within. And you - you have a wonderfully warped sense of humor! I love the titles for this trio. Can hardly wait for the newsletter to find out "why"! What incredible paintings these are!!!!! BEAUTIFULLY DONE!!!! and a great title! a very clever post! and thank you for thinking of me, your support and kind words are so helpful! Very glad to see you back again Suz! Thanks so much Kay! So glad you are joining in too! :D great traffic light trio sandra ! Brilliant. And the three of them together make a collector's delight. I'm glad it gave you a giggle Tracey! These three together makes the perfect piece, Sandra! You did a beautiful job...!!!! Looking forward to your newsletter!! I love quirky titles-some pieces practically name themselves but others have me wrackibg my brain for something original or thought provoking. 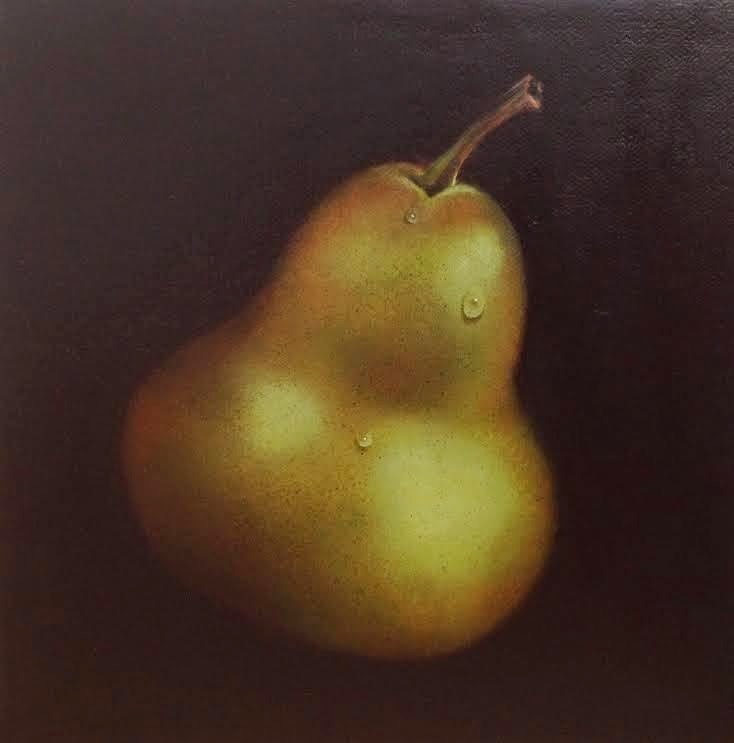 I love the collective title for the 3 pieces-very clever & your pear is divine! Why the bonkers titles... hmm will you defriend me if I tell you what I think? Haha! Clearly it's because you think I am a bonkers person then!